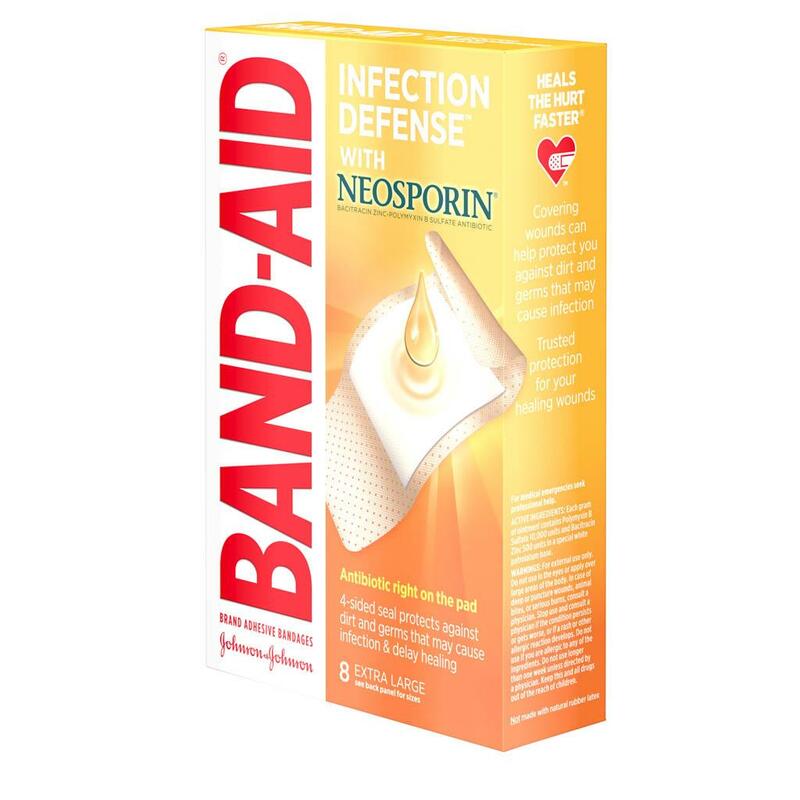 Get mess-free infection protection with these extra-large BAND-AID® Brand INFECTION DEFENSE™ Bandages. 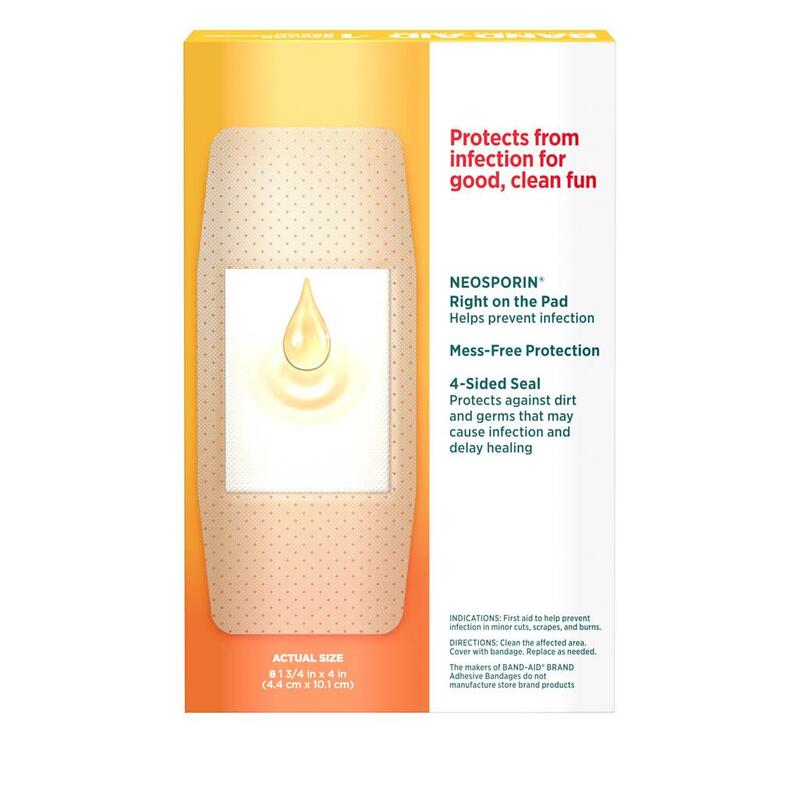 These sterile bandages have NEOSPORIN® antibiotic ointment right on the pad, and provide a 4-sided seal that protects against dirt & germs that may cause infection & delay healing. These BAND-AID® Brand Adhesive Bandages also have a HURT-FREE® Pad that won’t stick to the wound, allowing for gentle removal. This package contains 8 extra large antibiotic bandages. This product is the only thing you need. 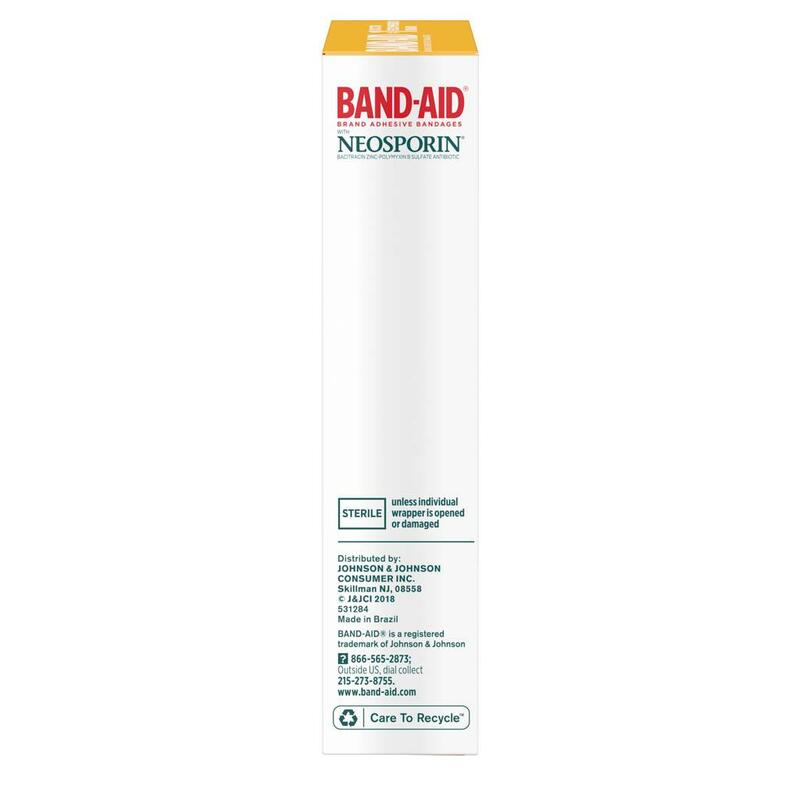 Love the Bandages with Neosporin embedded but there are often times when an injury requires a Neosporin bandage wider than the standard 3/4" wide bandage but smaller than the 2" wide bandage. 1" wide would be a nice optional size. Plus, it would be nice if the fabric type bandage came with the Neosporin option as it tends to stay attached and is easier to remove. This product use to be excellent but like most big business despite the huge tax cuts they got from the federal government they still have their overpaid CEO's constantly doing things to screw over the average everyday person and this is another classic example as the white part of the bandage that is used to cover the cut/wound Johnson & Johnson has shrunk the size of that white bandage part which you can clearly see on the photo of the product and if you've used the product in the past and have recently bought it you'll know. In the past the white bandage part of the Band Aid use to be as wide as the rest of the bandage but now it's much slimmer as Band Aid did this to all their products. Typical greed is the bottom line, raise the cost and give less, people should boycott the product as there are other still out there that do the same thing but give you what you pay for the full bandage without cheap cuts. Like the other 2 reviewers my skin came with the bandage, but help me with the healing process. So now i uses but cut the most of the tape edge only using approximately a little edge. :) and no more break skin. Hi there, thanks for bringing this to our attention. This certainly isn't something we'd expect from our bandages, so we'd like to learn more about your experience. Please call us at 866-565-2873; we're available Monday through Friday 9AM - 5:30PM ET. Looking forward to hearing from you soon! I am a fan of most band aid products. However I was surprised when I went to remove the band aid that the adhesive took my skin off with it. Hurts and stings, looks like only the outer edges of the band aid, unfortunately they are big band aids. We're sorry to hear this and want to help. Please give us a call at 1-866-565-2873. We're available Monday-Friday 9AM-5:30PM ET. We hope to speak with you soon.